As a business operator, you can chase any number of things. Each pursuit is different and you should know the risks and rewards. Some entrepreneurs are chasing fame. They want celebrity. Well, I’m not talking about that kind of pursuit. Instead, I’m talking about the things necessary to build and grow your business. Things like cash, products, services, employees, and customers. The first thing most businesses have to chase? Customers. Until you have a customer you don’t have a business. Every business needs people willing to trust us enough to buy whatever we’re selling! 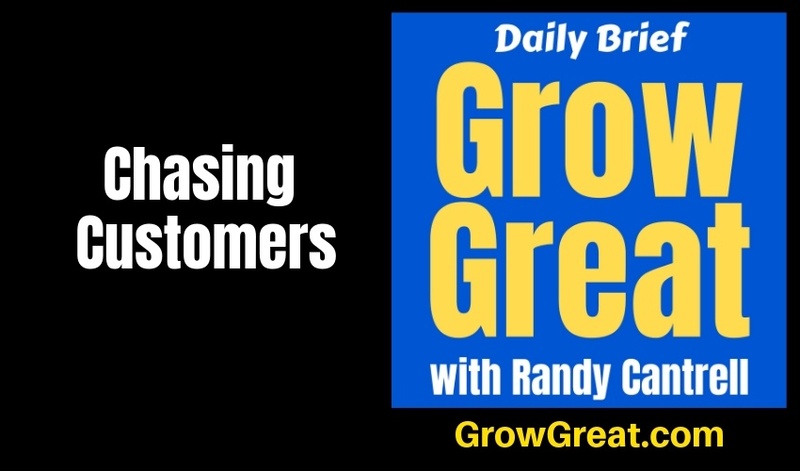 Finding and acquiring customers is a big, big topic. It’s what marketing and selling are all about. There are tons of experts willing to share their insights on how you can improve those activities. You’d think it would have all been thought of, written about, promoted and well known by now. And it probably has, except the tactical part. The tools are always changing. Human behavior adapts and adjusts, too. But the principles are likely tried and true. The difference is like a diet program…you have to figure out what resonates for you. Find what works. Chasing customers can be like any of these pursuits, exhausting. But there’s one thing about chasing customers that is different from some of these other business building/growth pursuits. The more quickly you’re able to get customers the more encouraged you are that your business is valid. Failure to capture customers is supremely discouraging and it may mean the idea isn’t valid. Or it may mean something else. It can be depressing and daunting to figure out what’s wrong. Why can’t I get customers? Or, why can’t I get more customers? It may be a million things and that makes this pursuit difficult when we’re struggling. It’s necessary to chase customers. It has to be the first pursuit. Above all others. Everything else can wait. When you’re starting out, even cash has to wait (kinda sorta) because your path to cash is a customer! Does “chasing” sound too adversarial? I get it. I don’t mean it like that though. I mean it as in chasing something good. Like pursuing something valuable. And like accepting the responsibility that you need to influence the outcome, not just wait for something to happen. I don’t mean corner people, coerce people, or even sell people. Selling people is ideally giving people the opportunity to make up their own mind by supplying them with the true value you can provide. Largely, it’s educating people on what’s possible. It’s not manipulating people into doing what you want. I’ll use myself as an example because it’s always easier to pick on myself than somebody else. I’m not saying what I do is perfect or even ideal. I think you need to figure it out for yourself and do what works for you. Everybody has to do what feels appropriate for them. If I were to put a percentage on the phone call, I’d say 95% or more is spent in me learning all I can about somebody. Less than 5% is spent even telling them what I’m offering – the solution or value I might offer. That’s not likely ideal for me, but it feels right to me. I’m sure I could close more business if I were pushier, but I’m not pushy. I treat everybody the way I’d like to be treated. I don’t ever want to corner a prospect. But almost every day I encounter people selling me and they’re willing (I can’t be sure how happy they are about it) to corner me. Or to try. Try to corner me and it won’t go well for you. And I’ll hang up feeling awful myself. Everybody loses. That’s just too high a risk for the other person and for me. So I never do it. NEVER. So for me, chasing and pursuit look an awful lot like a friendly, deep conversation that ends in a polite invitation. If people accept my invitation, great. If they don’t, I don’t judge them. Or get angry. Or feel like I blew it. Even though I’m sure sometimes I do blow it. So it goes. Life ain’t perfect and neither am I. New flash, you aren’t either! If we don’t ask, we won’t get. When you believe in what you’re doing – and I absolutely believe in what I’m doing – then extending an invitation is a perfectly honorable thing. Would you hesitate to hand somebody an invitation to a celebration because you want them to attend, but you’re afraid they may not want to? Well, don’t. Give them the opportunity to attend. Or not. And unlike that birthday party invitation, don’t put a negative spin on the outcome. If they accept, great. If they refuse, it doesn’t mean they hate you or your birthday party. Nothing is wrong with me. I’m peddling ideas and encouragement. Mostly. I want people to grow great. If I can contribute with this podcast and never collect a single dollar from you, that’s great. I’m happy to have that outcome. Why else would I do this podcast if I weren’t happy with that outcome? But if you check me out and think a coach could help accelerate your growth and you think I’d be a good fit for you, then that’s also a great outcome. My chasing customers look the same either way. I want YOU to get what you need to grow great. Period. It doesn’t make me better or worse than anybody. It doesn’t make how I roll right or wrong. It’s just what it is – it’s my personal commitment to how I need to roll in order to be happy with myself. I want you to be happy with yourself, too.